This week FLEW by. I've been extremely exhausted towards the end of the week and I just can't figure out why but I hope to kick it and be back on schedule next week. Can't believe February is just around the corner already! Reading: I have still not picked up a book this year - I am the WORST. But I did just sent a first edition of in Sophia of Silicon Valley that I am excited to read. NYC Life: So more regular life this week... my sister had her baby yesterday (YAY)!!! So I'm proud to be an aunt again, I got a raise and promotion at work and I SOBBED my eyes out during This Is Us. Like emotional week to the M-A-X. Weekend Plans: Andrew and I just got our Movie Passes in so hopefully we'll be able to knock out some of our Oscar list! I really want to see Mollys Game and Lady Bird but we have like 10 movies on our list!! I'm also going to be filming a lot this weekend (I'm back on my once a week posting schedule!) and have some fun videos coming your way! Most Popular Item This Week: You guys L-O-V-E-D this bow back sweater! Throwback Post: My review of my Apple Watch series 2! 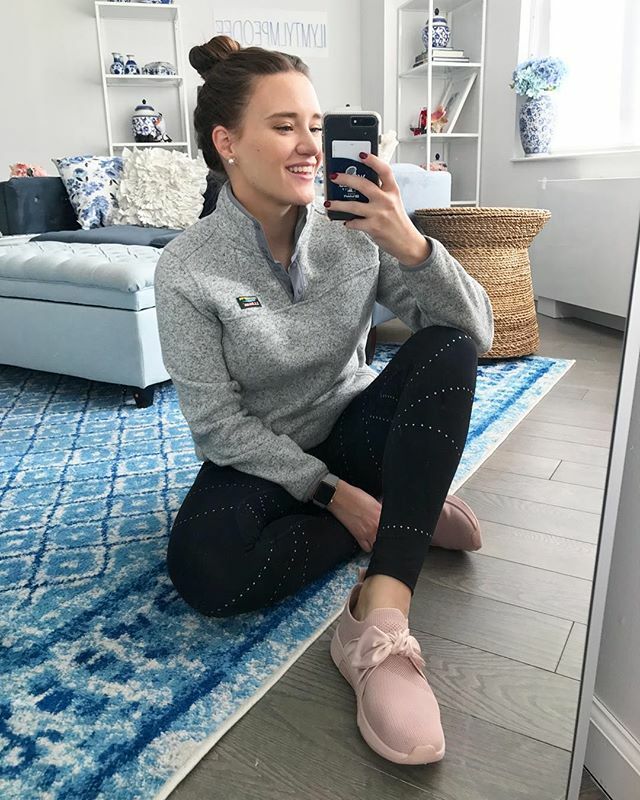 -Um did you know Old Navy makes really cute active wear?! -Olivia shared her 5 favorite apps for her business -- a great read! A Must Read: This is totally unrelated to the blog but is sommthgin that very much touches my work life. I read how 2/3 of BR revenue comes from social and their app (over their website) -- this is a big thing in the traditional media world! Amazon Purchases of the Week: Added all of my new purchases to my shop page! New sunglasses and a ton of makeup organization! Fitness: We are on week 7 and Andrew and I are hurting a lot lately -- his back and my shins/knees. I think I need to get new sneakers? I don't know. My knees feel like they jam against each other overtime I jump when I work out and for an hour after... Any suggestions? ?